Anyone who has spent time in Africa knows that creative problem-solving and entrepreneurship is everywhere you turn. That said, a recent report from The Omidyar Network and Monitor Deloitte addresses the need to find more ways to transition the creative energy generated by necessity-driven “survival entrepreneurship” into a high impact, flourishing entrepreneurship sector. The bad news: entrepreneurs in Africa say there’s a scarcity of capital, infrastructure, skills training, business advisory services, incubators and government incentives. The report also found that there are often unrealistic expectations about the entrepreneurial journey; as entrepreneurs worldwide can attest, the road is rarely short and paved with gold and instead is often long and filled with many ups and downs, failed experiments and thin margins. The good news: entrepreneurship is gaining traction among Africans as a career path and sector worth attention and investment. The recommendations index in the report contains an excellent series of concrete actions ranging from early-to-late stage financing to education and infrastructure, and then also indicates the mix of key players needed at each stage — including philanthropists, impact investors, civil society organizations, government, educational programs and academic institutions. I hope this important report sparks conversation, debate, investment and some fantastic new initiatives. 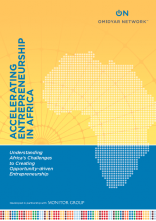 “Accelerating Entrepreneurship in Africa” is a 48-page report on entrepreneurship in Africa based on interviews conducted in Ethiopia, Ghana, Kenya, Nigeria, South Africa, and Tanzania. Photos below are from my trip to visit some of the Philanthropy Secretariat of Liberia‘s featured entrepreneurial initiatives: the Starz College of Technology and Mambhan Agricultural Project. For more information about these projects, contact the Secretariat.